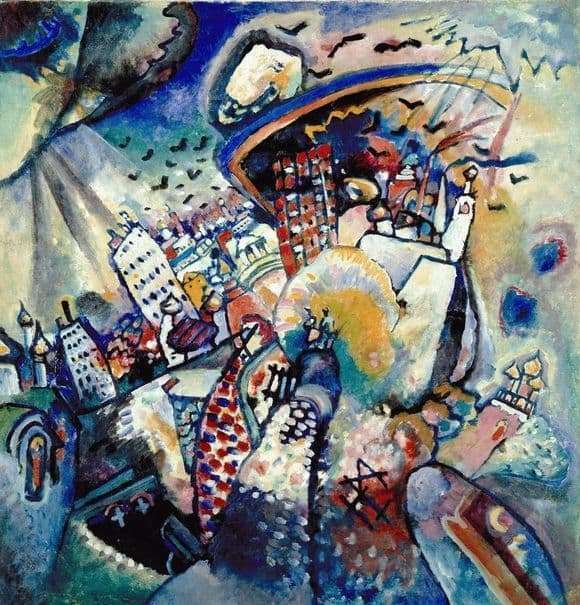 Vasily Vasilyevich Kandinsky loved Moscow very much. He said that Moscow is a complex and mobile city. He called it a confusion, where events, destinies and people intertwine. But at the same time for him Moscow is the most beautiful city on the planet Earth. It is therefore not surprising that his source of inspiration is Moscow. It was to her that he dedicated several paintings, the main of which is considered the painting “Moscow. The Red Square”. Vasily Vasilyevich Kandinsky lived in the late 19th, early 20th century. He is known around the world as one of the founders of abstract art. This is a genre of painting that many people do not recognize and do not understand. Unusual combinations of colors, shapes, fantastic plots – all this is characteristic of abstractionism. At first glance, in the painting “Moscow. Red Square “is generally impossible to recognize Moscow. Somewhere in the distance are bells, chapels, large white houses. But it is absolutely not clear how in this one can recognize the city. Moscow for Kandinsky is a big confusion, so everything in his paintings is intertwined, confused, incomprehensible. But if you look closely, you can see the famous pavement in Red Square. You can see little men, and even a building that looks like the Bolshoi Theater. Bright colors are very important for abstractionism. Wassily Kandinsky chose yellow, blue, red and pink for his Moscow. The technique itself is very specific. Kandinsky painted with large strokes of oil. Colors, he tried not to mix, to get a bright and clear picture. Many people do not understand abstract art. They believe that every person can draw like this, and this should not cost a lot of money. But, nevertheless, paintings by Kandinsky and other artists who painted in this style are sold at auctions for big money. But this picture is stored in the Tretyakov Gallery, in Moscow.